καὶ τὸ τῶν Ἑλλήνων ὄνομα πεποίηκε μηκέτι τοῦ γένους ἀλλὰ τῆς διανοίας δοκεῖν εἶναι, καὶ μᾶλλον Ἕλληνας καλεῖσθαι τοὺς τῆς παιδεύσεως τῆς ἡμετέρας ἢ τοὺς τῆς κοινῆς φύσεως μετέχοντας (The name Greek is no longer a mark of a race, but of an outlook, and is accorded to those who share our culture rather than our blood) Isocrates, Athenian orator, 380 BC. Panegyricus. The word “Technology” comes from the Greek word technikos which means „artistic, professional“. I was asked what is the difference between an engineer and a scientist? For example Heron of Alexandria or Ctesibius, or Philon of Byzantium are more engineers than scientists like Archimedes and Euclid. What is the difference between a scientist and an engineer? A scientist likes surprises, not so an engineer. First there is practical no original source that describes the technology of ancient Greeks. Archimedes did not consider worth to write about his inventions and the work of Heron is from translations or text written later. We have various indirect sources such as from Vitruvius. A large number of original sources was destroyed by events like the fire of the Alexandria Library, by fanatics, or by natural causes. 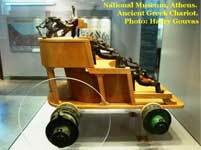 Devices like the repeating catapult of Dionysius, the planetaria of Archimedes like the Antikythera device, Gigantic ships or steam engines shows that ancient Greeks were not only “theoretical oriented” but that theoretical and applied science are connected together. Only the last 50 years we have a clearer view of the Greek technology and we understand that significant part of this knowledge did not survive. An assumption is that the “aristocratic” Greeks were not interested to gets their hands dirty. But there was a technological advance due to economic reasons or because of the necessity to produce better weapons. And YES! The development of money (probably introduced first by the Lydians) in form of coins and trade was also very important. Trade and the political system was probably one of the main reasons of the rapid development of Science and Philosophy in Greece. With Alexander the Great Greek language became the language of Science. 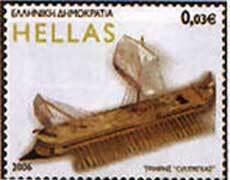 Some say that the most important place in Ancient Greece was not the Agora but the Barber Shop. It played a very important role in the life as news were transmitted there from the barbers who were famous for excessive talking. Once a Spartan was asked by a barber how to cut his hair. His response was : "Silent". Some say that the first barber shops in Rome were introduced by the Greeks. The barber shops were not very different than today having a large mirror for the clients, a comfortable chair (called thronos or throne) and various devices such as razors, knives, etc. Probably the most famous barber was Ctesibius of Alexandria. 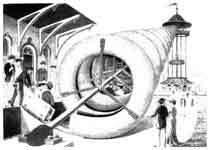 He develop pneumatic devices among which the organ, the first high tech musical instrument. His first invention was a counter-weighted large mirror for the barber shop of his father. Homer describes in the Iliad a heroic epoch of the past. In order to control a large population Sparta was transformed into a militaristic society. But they were not innovative enough. The Thebans developed a more efficient Phalanx and especially the Macedonians organized their army more efficiently, used siege towers and catapult devices that were used and developed by the Greeks in their colonies in Sicily. In the last few years the internet has been transformed to the Library of Babel once invented by Jorge Luis Borges by the so called "Garbage Sites" . Unfortunately the main Search Engines cannot control or do not want to control these sites. Programs scan the internet and produce automatically many hundred millions of "junk" pages only with external links that are often topic unrelated and which change each day. The idea is that it is possible to increase the rank in search engines and to earn money via advertisements even without content. And we shall assuredly not be without witnesses; there are mighty monuments of our power which will make us the wonder of this and of succeeding ages Pericles' Funeral Oration (Thucydides 2.35-46) Pericles used the important moment after the victory over the Persians to establish a league between many city states and Athens and then later use the money collected from these states to build the magnificent Acropolis buildings. During the Hellenistic period engineers were able to produce spectacular buildings such as the Pharos of Alexandria and the Colossus of Rhodes a statue large as the Liberty Statue in New York. In his trip to the moon (Icaro)Menippus, the first Greek Astronaut, tries to see if the Colossus and the Pharos are visible from outer space (like the Great Wall of China). The Parthenon and the Acropolis , The Walhalla "Parthenon"
History of Science is about as useful to scientists as ornithology is to birds. My version of Richard Feynman's remark about Philosophy of Science. Historic events related to science and technology of Greeks or events that are related to ancient Greeks until the time of the post Greek Scientific revolution that started with Galileo, Newton and others. Can we trust any timeline? Even the eclipses such as described by Thucydides and others cannot all be reproduced. From possible errors in the translation, manipulation etc inconsistencies when analyzed sometimes enable some (including known mathematicians) to claim even that centuries of history have been invented or did not exist. While I am not happy to find sometimes 10-20 years differences in the dates of some event from various sources it is amusing to read reports that Jesus was born 1559 years later than usually supposed. Ancient science was the product of a very few men; and these few happened not to be Egyptians. A. Neugebauer. About this comment one could write many books. I think it is too negative and typical a problem of some who ignore that pure science requires some “primitive” accumulation of facts. Which places did Democritus visit (some assume that he was in India) and what did he learn there? What did the Greeks learn from others and how important was this knowledge? Is it also true that even today science is the product of a very few and the other millions of scientists are doing just “tabulation physics” filling only tables with numbers? The days of the scientific revolutions like in the early last century seem over but the number of publications increases exponentially. Even with the problem of an extreme specialization from the knowledge accumulated as Aristotle would say “gignesthai mega ti”, something great is produced. The good Christian should beware of mathematicians and all those who make empty prophecies. The danger already exists that the mathematicians have made a covenant with the devil to darken the spirit and to confine man in the bonds of Hell. 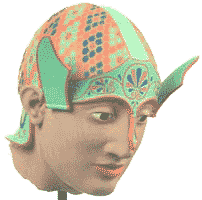 Greeks like Thales from the Ionian islands around 600 BC visited Egypt and Babylon. They acquired the practical knowledge accumulated over centuries and promoted it into Science. Greeks obtained Geometry as an art of measuring the land from the Egyptians as Herodotus describes. The influence of Greek mathematics continues through the ages. Arithmetic, music, geometry, and astronomy – pure number, applied number, stationary magnitude, and magnitude in motion respectively – began life in Plato’s Republic and constituted the quadrivium of sciences up to 1600 AD and later. Eudoxus and Archimedes exhaustion methods were only extended by Cauchy and Weierstrass. The discovery of a proof of Fermat’s last theorem in 1993-4 shows how even current mathematical activity originates in Greek mathematical activity. Also the last years we have some remarkable discoveries analyzing the work of Archimedes and Hipparchus. A characteristic Greek discovery that the square root of 2 is not a rational number is for me one of the best examples that Greeks were interested in true science. One has to think that how surprising it is to discover that you cannot express this number in the form a/b where a and b are integer numbers. You can approach it with an accuracy as good as you want if you choose very large numbers for a and b but whatever you choose it will be never exactly the square root of 2. So there is a special type of numbers, the irrational numbers. For engineering purposes even small numbers for a and b would be enough but the proof of the irrationality of the square root of 2, although so simple, shows what the difference is between engineering and pure science. Pythagoras most important achievement is his idea that everything in the Universe can be expressed by numbers. Plato was fascinated by this idea and he used the Platonic solids as the building blocks of the Universe, the first primitive mathematical cosmological model. Today mathematical physicists try to fulfill the dream of Pythagoras. The only mistake of Pythagoras is that mathematics can describe everything except that what is really personally important. Combinatorics: Did Hipparchus discover the Schröder numbers? Euclid's Proof of existence of infinite prime numbers, The Erdös BOOK and the Library of Borges , Euclid's Fourteenth Book? Socrates demonstrates that an uneducated person has mathematical knowledge. Only during our birth we have forgotten the knowledge.. learning is a reminiscence process (anamnesis). Why do we need teachers? The answer: mainly for temporary (in principle useless ?) knowledge. Babylonian astronomy was quite advanced after centuries of astronomical observations before the Greeks applied for the first time mathematical models and especially geometry. Who had first an idea of a heliocentric model is not known. In a Sumerian image one can see in the sky something that looks like the sun surrounded by planets. But there are no written comments to my knowledge that support this. Is the central object the sun or a so-called central fire that Pythagoras and his students considered in their cosmological model. It could be possible that Pythagoras had these ideas from his visits in Egypt and other countries. Anaxagoras idea about the sun was considered as a crime and in this way he was treated by the ancient Greeks like the Christians later treated Galilei. Aristarchus developed a heliocentric model but this was not accepted by others because parallax measurements did not support the model. Only in 1836 it was possible to measure the parallax. The influence of the Greek astronomy was very important. Greeks knew that the Earth is round, some even developed a heliocentric model, the dimensions and distances of the Earth and planets have been measured with the best accuracy that is possible without advanced instruments that were available only later than 1600 AD. Democritus believed that the Milky way is a collection of distant starts and that extraterrestrials exist. There is even some evidence that ancient Greeks knew Newtons inverse square gravity law (or is it more correct to say that Newton knew the ideas of Hipparchus and others?) It is not true that the Greeks believed that the world is small. Democritus, Epicurus, and Metrodorus of Chios among others believed that the world is infinite large and that extraterrestrial life is a consequence of this possible. The planet Uranus was discovered in 1781, by William Herschel. a musician who had become both the director of the orchestra at the celebrated spa, Bath, and a first class astronomer. His fame was crowned by the discovery of a new planet, named Uranus after Urania, the muse of astronomy and geometry. Info .About the name of the Planet Uranus around 30000 websites say it was given the name of the Greek God Uranus but 300 websites say it was given the name of Urania. This is unusual as almost all other planets have the names of Gods but Urania is a muse. Nevertheless I think this is true as Herschel was a musician and he knew the muses. The Homocentric Spheres of Eudoxus. Did Hipparchus discover Newtons gravity and inverse square law? Comments about Heliocentric Ideas of Aristarchus and Copernicus, did the almighty God stop the Earth rotation for Joshua ? Astrology originally from Mesopotamia (probably since the 3rd BC millenium) was developed further in the Hellenistic period, especially in Alexandria (Tetrabiblos of Ptolemy). Hellenistic astrology was transmitted to Europe and China indirectly by the Arabs and also to India (even if China and India had a much older astrology prehistory). Astrology was combined with medicine or with chemistry forming the pseudosciences of “iatromathematics” and “alchemy”. Even if it contradicted Christian religion astrology was teached in various Universities (Bologna, Florence, Paris...) and only in the 18th century the scientific community had turned away from astrology. Ancient Greeks measured with high accuracy the circumference of the Earth. The provided the maps that were used even until C. Columbus who using wrong numbers for the stadium distance underestimated the distance he had to travel to reach India. Why probably America was discovered , Was Columbus a Greek ? Maybe in a few months we will know the answer. Pelican, from Gk. pelekan (Aristotle), perhaps due to the shape of the bird's bill as a pelekys (ax) , pelekas (woodpecker) . The word parasite (paraseitos, para seito, eating beside) initially was a religious word describing a person who participated in the meals of Gods and who also helped the priests in religious actions (such as the Apollon Delion cult). In addition a person to whom as honor a meal on public expenses in the Prytaneion in Athens was granted was called a parasite (among these parasites was the father o medicine: Hippocrates of Kos). Also a character in Greek theater is described as “parasite”. Elements of the evolution theory of Darwin were discovered by the ancient Greeks who also produced a remarkable classification of animal and plants. It is scarcely an exaggeration to say that even in 1900 the only new idea to Leucippus's theory was that each chemical element was identified with a separate atomic species. David Park, The How and the Why: An Essay on the Origins and Development of Physical Theory. Princeton NJ: Princeton University Press, 1990. Because gods perceive future things, men what is happening now, but wise men perceive approaching things. Philostratus, Life of Apollonius of Tyana, VIII, 7. Ancient Greeks developed the idea of the atom. This idea was not accepted initially and instead Greeks used states of matter such as fluid, solid, gas, or plasma as a model of matter. 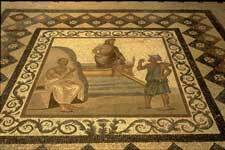 Thales started with water, Anaximenes with air, Heraclitus with fire as the basic substance of the Universe. Empedocles added earth and combined these four “elements” together under the action of eros (love) and neikos (strife) in a theory that Aristotle further developed. Aristotle was critical about the idea of atoms of Leucippus and Democritus. The idea of the transformation of materials into gold initiated a new discipline “Alchemy” in Alexandria by the Greeks and others. The search of a method to produce gold some say was important for the development of the real science of chemistry. Whether this is true is difficult to judge, were the endless and probably not systematic experiments of amateurs really so important? At least it took more than 1500 years to replace alchemy by chemistry. 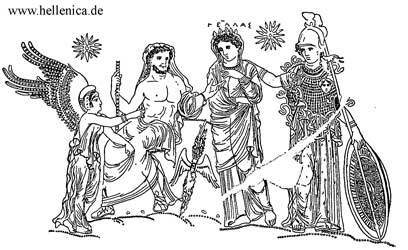 I will provide soon information of the knowledge of the ancient Greeks about different elements. Ancient Greek medicine played an important role for almost 1500 years. Galen was probably the most important Physician of all time and his collected work includes around 20000 pages of text. Only with Vesalius and others around 1600 AD the knowledge again was improved. How important health is is described in the story of Tithonus and Eos. Eos asks Zeus to make Tithonus immortal but she does not ask that Tithonus should also remain young. The tragic story is that Tithonus gets older and weaker but death is impossible for him. Death is important as the story of Sisyphos describes. Is an eternal life really so important? Is eternal happiness possible? Odysseus chooses a limited life with his wife Penelope, who is 20 years older when he left Ithaca, than an eternal life with a beautiful "young" goddess. In the night when we sleep sometimes the brain activity is hgher than in the morning. In the night while we sleep we learn, the brain processes the information that was accumulated during the day. Everything You Always Wanted to Know, But Were Afraid to Ask !